General MacArthur gave this address to a joint session of Congress shortly after being relieved of command in Korea by President Truman. 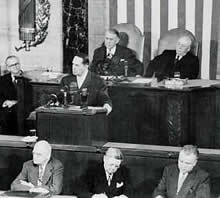 While many members of Congress applauded enthusiastically, Harry Truman was not impressed. He was sure MacArthur was planning to run for president in 1952. I stand on this rostrum with a sense of deep humility and great pride -- humility in the wake of those great American architects of our history who have stood here before me; pride in the reflection that this forum of legislative debate represents human liberty in the purest form yet devised. Here are centered the hopes and aspirations and faith of the entire human race. I do not stand here as advocate for any partisan cause, for the issues are fundamental and reach quite beyond the realm of partisan consideration. They must be resolved on the highest plane of national interest if our course is to prove sound and our future protected. I trust, therefore, that you will do me the justice of receiving that which I have to say as solely expressing the considered viewpoint of a fellow American. In this situation, it becomes vital that our own country orient its policies in consonance with this basic evolutionary condition rather than pursue a course blind to the reality that the colonial era is now past and the Asian peoples covet the right to shape their own free destiny. What they seek now is friendly guidance, understanding, and support -- not imperious direction -- the dignity of equality and not the shame of subjugation. Their pre-war standard of life, pitifully low, is infinitely lower now in the devastation left in war's wake. World ideologies play little part in Asian thinking and are little understood. What the peoples strive for is the opportunity for a little more food in their stomachs, a little better clothing on their backs, a little firmer roof over their heads, and the realization of the normal nationalist urge for political freedom. These political-social conditions have but an indirect bearing upon our own national security, but do form a backdrop to contemporary planning which must be thoughtfully considered if we are to avoid the pitfalls of unrealism. The Pacific was a potential area of advance for any predatory force intent upon striking at the bordering land areas. All this was changed by our Pacific victory. Our strategic frontier then shifted to embrace the entire Pacific Ocean, which became a vast moat to protect us as long as we held it. Indeed, it acts as a protective shield for all of the Americas and all free lands of the Pacific Ocean area. We control it to the shores of Asia by a chain of islands extending in an arc from the Aleutians to the Mariannas held by us and our free allies. From this island chain we can dominate with sea and air power every Asiatic port from Vladivostok to Singapore -- with sea and air power every port, as I said, from Vladivostok to Singapore -- and prevent any hostile movement into the Pacific. The Japanese people, since the war, have undergone the greatest reformation recorded in modern history. With a commendable will, eagerness to learn, and marked capacity to understand, they have, from the ashes left in war's wake, erected in Japan an edifice dedicated to the supremacy of individual liberty and personal dignity; and in the ensuing process there has been created a truly representative government committed to the advance of political morality, freedom of economic enterprise, and social justice. Of our former ward, the Philippines, we can look forward in confidence that the existing unrest will be corrected and a strong and healthy nation will grow in the longer aftermath of war's terrible destructiveness. We must be patient and understanding and never fail them -- as in our hour of need, they did not fail us. A Christian nation, the Philippines stand as a mighty bulwark of Christianity in the Far East, and its capacity for high moral leadership in Asia is unlimited. "Why," my soldiers asked of me, "surrender military advantages to an enemy in the field?" I could not answer.